Food hawkers have been selling street food on the streets in Hong Kong for as long as the city has existed. Stinky tofu, curry fish balls, and egg waffles are just a few of the classics, and it’s not hard to get drawn in by their smell before you turn around the corner. As hawking is illegal in Hong Kong, most street foods are found at small shops crammed together in busy districts such as Mong Kok and Causeway Bay. There are still street hawkers in business though, but you’ll only be able to find them late at night in grassroots neighborhoods such as Tin Shui Wai and Yat Tung. Otherwise, street food hawkers can be found among the most puzzling part of the city during the first three days of Chinese New Year as the police and health department staff turn a blind eye during the festivities. The hawkers often set up “shop” with their handmade carts in public housing estates and sell their affordable snacks to passersby. During winter, you can even see hawkers roasting chestnuts in a huge wok, along with goods such roasted sweet potatoes and quail eggs. You know it’s getting cold when you can smell the aroma of roasted chestnuts from a block away. Here’s our guide to a selection of local favourites that you need to try when you’re traveling in Hong Kong. This is hands down my favourite childhood snack! Egg waffles are made with a batter of egg, butter, and sugar. They call it bubble waffles in the West since it looks like a gigantic version of bubble wrap, but I prefer calling it egg waffles since it's closer to what the Chinese term entails. The best egg waffles are crispy on the outside while the inside is puffy and it's a bit gooey for the texture. Most egg waffles you can find in Hong Kong are made with electric egg waffle maker, but the traditional way is made over a charcoal grill. The original one will always remain on top of my list, but I also like to change things up a bit and try out flavors such as matcha with red beans, black sesame with mochi and chocolate ones (think brownie and egg waffles). As one of the most iconic street food in Hong Kong, fish balls are dirt cheap and often serve as a quick bite for locals who just get off from school or work. They’re usually made with a mix of fish batter, flour and gum (not exactly the healthiest) and dipped in either soy sauce or curry sauce. However, the ones in fishball noodles are made differently - those white fish balls with a bouncy texture are known as the Chiu Chow style fish balls and every single one is made by hand using a traditional method. You know winter is coming when the aroma of roasted chestnuts hits you even before you turn around the corner. The hawker’s cart has a huge wok that slowly roasts the chestnuts while the sweet potatoes are served piping hot in brown bags. Smoked quail eggs are also quite fun to munch on. There’s nothing as comforting as having a hot, roasted sweet potato in your hand. 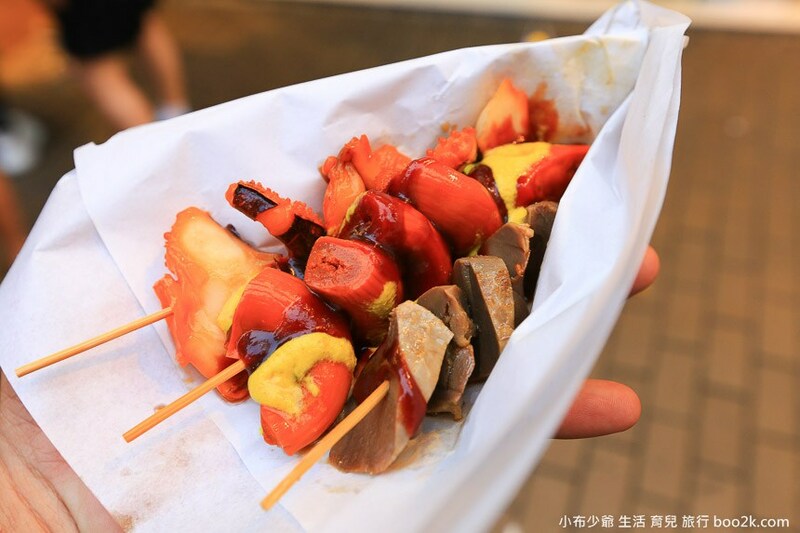 * Where to get these roasted goodies: There's no permanent locations for these street food vendors, but you'll find them pretty easily during autumn and winter in Hong Kong. This is my go-to street food if I’m in a rush and want a quick bite. Vendors sell an assortment of eggplants, green peppers, tofu and red sausage in a combo of three to five pieces. The meat and veggies are filled with a layer of fish paste, which are then pan-fried on a griddle and tossed into a thin paper, drenched with as much soy sauce as you like and served inside a plastic bag. You can also find the green pepper from the “Three Treasure” at dim sum restaurants. There are often one or two pieces that are actually pretty spicy, so do watch out! * Where to find them: Any street food stalls that sells fish balls and siu mai would have this snack! Hong Kong’s take on classic waffles is even heartier than the American ones. The traditional waffles are served as a sandwich, filled with plenty of butter, condensed milk, peanut butter and a mix f sesame, coconut strands, and sugar. This sugar bomb is rather filling, and I remember having a whole one for lunch when I was still a student, just to save up some extra pocket money! The famous Cheung Chau mochi has been opening up shops all around in the city in recent years, and I always stop by to grab a mango mochi or durian mochi when I pass by one. Mochi is a glutinous rice casing that's usually filled with different kind of fruits. Mango is usually a best-seller and if you like durian, you cannot miss out! While one cannot know for sure if the owners are actually all from Cheung Chau (a small island that's a ferry ride away from Central Pier), these mochis are just still as good. If I have to pick a Chinese pastry that represents my childhood, it would be egg tarts. There’s always a debate whether the flaky puff pastry or the shortbread crust is better. Either way, both are filled with a custard that’s rich in egg, and it’s surprisingly light and less creamy than expected. 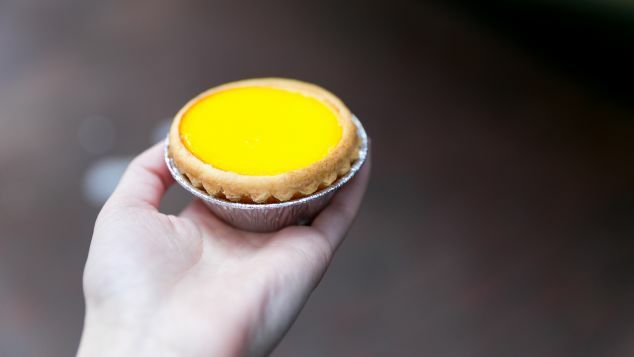 There’s nothing quite like a freshly baked egg tart that comes right out from the oven! There are two types of cheung fun you can find in Hong Kong, the plain, simple fare you can find in food stalls in the wet market or the ones filled with barbecued meat, shrimps or beef at dim sum restaurants. The street food version is served with soy sauce, sweet sauce, peanut sauce with sesame sprinkled on top. These rice paper rolls are filling enough for breakfast or a quick snack. This simple Cantonese sweets has become a rare species over the past few years. Street hawkers carry transparent metal boxes around and I always run to grab one as soon as I spot it on the street, since it's quite hard to find people selling tong chung bang in the city these days. The little sweet wrap is filled with tong chung, a crunchy candy wafer that's hollow on the inside, and shredded coconut and sesame, wrapped with a delicate thin crepe. Besides egg tarts, this is also my childhood in a nutshell! * Where to find this sweet: You'll have to count on your luck to see if you can spot a hawker selling them on the street! If you go to Festival Walk in Kowloon Tong, a Chinese grandpapa sells the little treat on the footbridge from the mall to the MTR station. This dish is just as popular on the street as it is in dim sum restaurants, and you can often find customers ordering siu mai along with curry fish balls at the stalls. The steamed siu mai is usually made with a fish filling with a thin yellow pastry wrapped around it. I love dipping it into sweet soy sauce and drenched it with chili oil for an extra kick. It is rather true when they say the Chinese don’t like to waste a single part of the animals. Braised offal skewer is a delicacy that locals grew up and the assortment ranges from pig ears, chicken kidneys, squid tentacles to duck tongues. The skewers are cooked before being served chilled, and topped with soy sauce, sweet sauce and yellow mustard. The spice can kick in pretty hard and make your eyes go watery, just like the effects wasabi has. It might sound weird but intestines are quite common in Chinese cuisine. Vendors cleans the intestines thoroughly before deep frying the entire thing in a wok of oil. It's then chopped into big chunks, served with a stick and you can top it with sweet and sour plum sauce or just plain, old sweet sauce. It's super crunch on the outside while its texture is tender on the inside. I don't deny I crave for it from time to time! Pig's intestines are also served as its own dish at Chinese restaurants, such as stir-fry pig intestines with peppercorn and chilli (Sichuan style). Just like durian, you either hate it or love it when it comes to stinky tofu. This iconic street food is known for the stench, and some find it so overwhelming that they walk faster just to get away from the stink. The crispy tofu is topped with plenty of sweet sauce and chili bean sauce. It’s a popular snack in Asia, and each country has a different take on it. Fun fact: I've had the most pungent, awful stinky tofu in Taipei last year. The stinky tofu I had there was nothing like the ones in Hong Kong. It was a soft version of stinky tofu and let's not talk about whether I'll ever have it again. But do I like this weird Asian food? Oh, you bet I do, but only the Hong Kong version though! What’s your favourite street food in Hong Kong? Let us know by leaving a comment below!